Don we now our ugly sweaters…it’s time to party! Is there anything sillier? Or more deserving of a party? We think not. The more ridiculous the better, as far as I’m concerned. Glitter, sequins and pom poms are all a GO! Does your sweater light up or sing? Even cooler. I’ve even seen themed shoes to match. Simply secure mini bows to a pair of house shoes to rock a head to toe look! At our annual ugly sweater party, it’s not just the attire that is laughable… it’s time to have fun with the food too. In fact, I have a whole stash of holiday sprinkles for the occasion. I collect them throughout the year for the sole purpose of making ugly sweater sugar cookies. Admittedly, not everyone puts as much planning into an ugly sweater party as I do. Thankfully, Harris Teeter is here to help as your one stop shop for party supplies, holiday baking essentials and your hostess gifts. A few days before your ugly sweater party, be sure to use the Order Ahead feature on HarrisTeeter.com for everything from party platters, a full holiday dinner spread, subs and desserts. After that, make one or two of our ugly sweater themed treats and you’ll be well on your way to your wackiest event of the season. 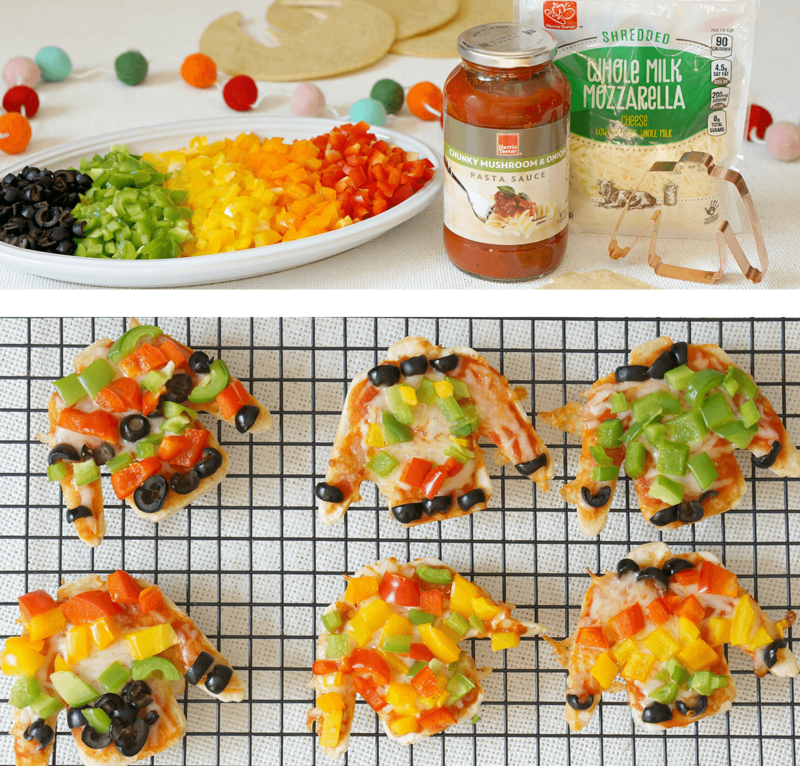 Young and young at heart will love these make-your-own ugly sweater pizzas! The uglier the tastier! Preheat the oven to 375°F. Use the sweater cookie cutter and firmly cut out the crust or tortillas to form your sweater pizzas. Spread a small portion of tomato sauce onto each pizza. Top with cheese and assorted vegetables. Bake for 6-9 minutes or until the cheese has melted and vegetables are cooked. May all your sweaters be ugly and bright. Including the ugly sweater cupcakes you serve to your guests! Arrange the cupcakes to form the shape of the sweater. Use the marshmallows to outline the neck, the bottom of the shirt and each sleeve. Soften the cookie icing according to package directions and make loose swirls to simulate the lighting string. Accent with the candy lightbulb icing decorations. Set up a DIY cookie decorating station at your party or hand these Ugly Sweater Sugar Cookies out as party favors or awards for your Ugly Sweater Party. Assorted Candies and Sprinkles - the sillier the better! Preheat oven according to package directions. Roll out prepared dough to ¼” thickness. Using the cookie cutter, stamp out the cookies. Repeat the process until all of the dough has been used. Carefully transfer the cookies to baking sheets lined with parchment paper. 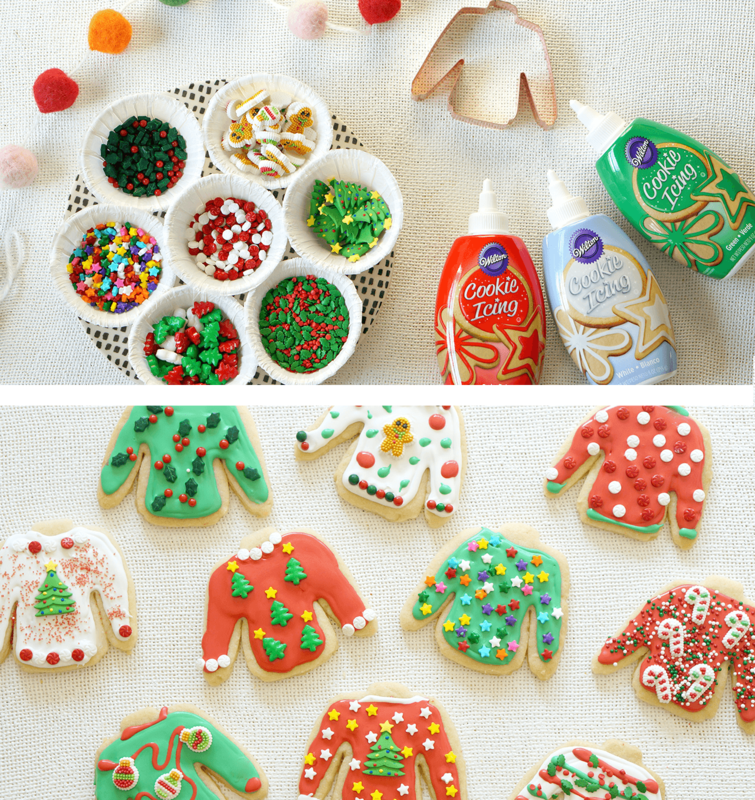 Outline the cookies with cookie icing and allow the icing to set slightly, then fill in each sweater. Immediately decorate however you choose. Allow the icing to set completely before storing in an airtight container. Not the host? Never Show Up Empty-Handed! If you’re attending several holiday parties (or plan on hosting one or two), be sure to stock up on great wines at your local Harris Teeter. Heading to an Ugly Sweater Party? Gift your wine in an ugly sweater of its own!